king kong | What happened in…. 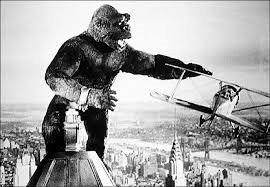 King Kong is a 1933 American fantasy monster/adventure film directed and produced by Merian C. Cooper and Ernest B. Schoedsack. The screenplay by James Ashmore Creelman and Ruth Rose was from an idea conceived by Cooper and Edgar Wallace. It stars Fay Wray, Bruce Cabot and Robert Armstrong, and opened in New York City on March 2, 1933 to rave reviews. The film tells of a gigantic, island-dwelling ape called Kong who dies in an attempt to possess a beautiful young woman. Kong is distinguished for its stop-motion animation by Willis O’Brien and its musical score by Max Steiner. The film has been released to video, DVD, and Blu-ray Disc, and has been computer colorized.King Kong is often cited as one of the most iconic movies in the history of cinema. In 1991, it was deemed “culturally, historically and aesthetically significant” by the Library of Congress and selected for preservation in the National Film Registry. It has been remade twice: once in 1976 and again in 2005.